Orzeszek Timer Countdown is a free countdown timer for windows 8 that enables you to set time format and count it down to zero. This software for Windows 8 is one of the best timer count down that helps you to complete your task in a selected time by giving a notification sound. 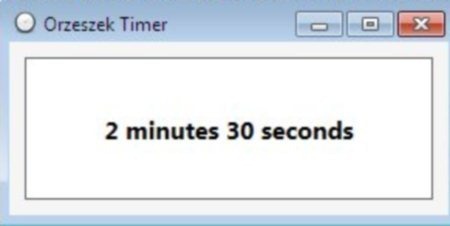 This Windows 8 software lets you set multiple timers at the same time. For setting multiple timer, you have to download the software multiple times. It means to set multiple timers, you need to download the software again and again. Well, thats the worst part. The interface of countdown timer for Windows 8 is very easy-to-operate. All you have to do is to select a suitable time and enter that selected time into a format. After that, the timer will give you a notification sound when it come down up to zero. You can do additional settings in the timer like change a sound, pop-up when done, close when done and the like with a single click. You can also browse around our other post on Windows 8 Software. Enables you to do settings in the timer. Enables you to set multiple timer software windows 8 at the same time. Reliable and easy to use interface. Go here to open the web page of Orzeszek Timer. Since the downloaded setup is a Zip file, hence you need to extract all files in order to install it. Once extracted, click on the Orzeszek setup to run. Soon you will find the software installed as you follow-up with the on-screen instructions. Orzeszek Timer is a good utility countdown timer for Windows 8 that will be proved very useful software to the users of Windows 8. Give it a try.